This entry was posted in Uncategorized on 28 April 2014 by zeidlerm. 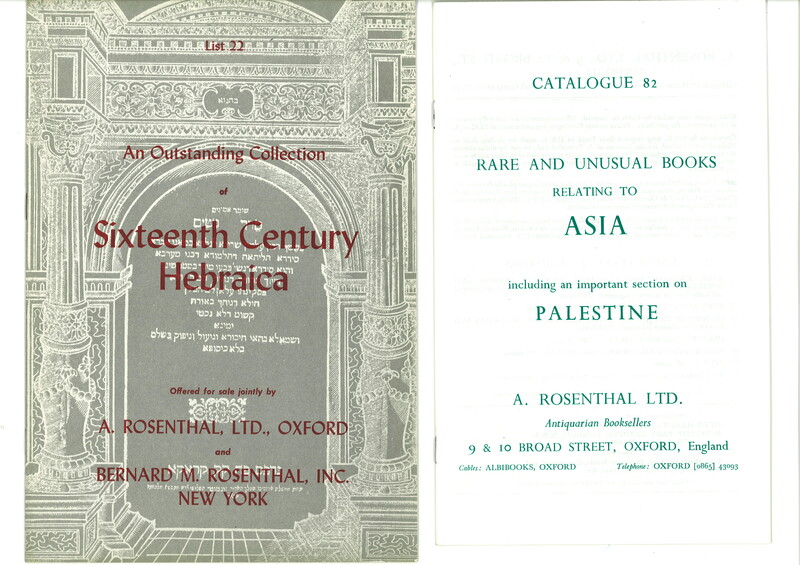 The Oxford based firm A. Rosenthal Ltd., specialises in selling Judaica and Hebraica related books. The antiquarian book seller deposited some of their back catalogues, card catalogues, ledgers and book plates amongst other things to the Leopold Muller Memorial Library. Rosenthal compiled book catalogues of rare and unusual material and grouped them into specific subject areas. Including these two catalogues pictured. The catalogue of ‘Sixteenth Century Hebraica’ was a list of books intended to be sold together as a complete collection. The collection included Hebrew books printed between 1505 and 1609. Rosenthal created this collection, in collaboration with Bernard M. Rosenthal in New York. The books were not part of a previous collection; instead the booksellers brought together books that they perceived to be valuable and also rare. 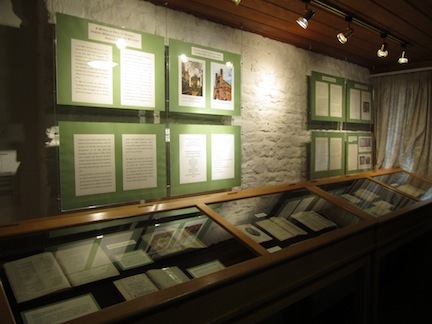 The description of the collection highlights the uniqueness of the texts chosen, favouring first editions, as well as only including books that were complete and in good condition despite their age. The books in this catalogue were mostly printed in Italy, although there are also books from rare presses in Greece and Italy. 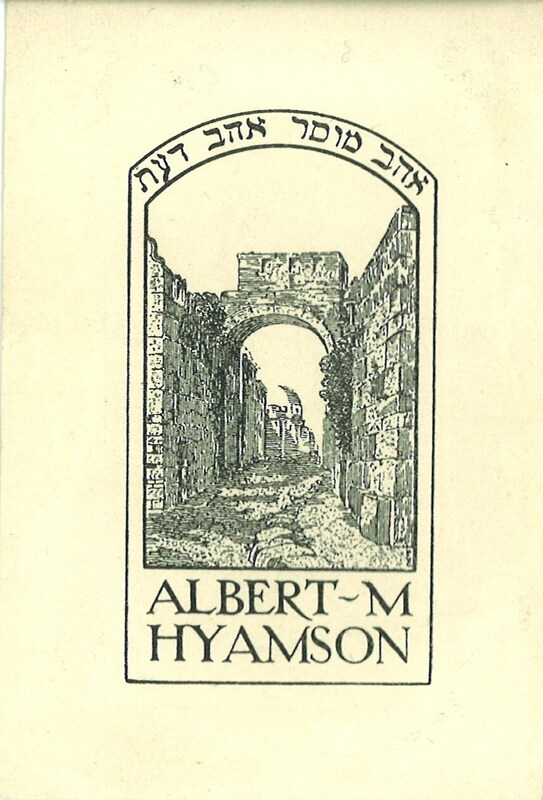 Catalogues such as this provide valuable insights and information into early Hebrew printed books, but also the antiquarian book trade in the twentieth century. The Rosenthal collection also includes company ledgers and sales books, which include many famous names within the field of Jewish studies. 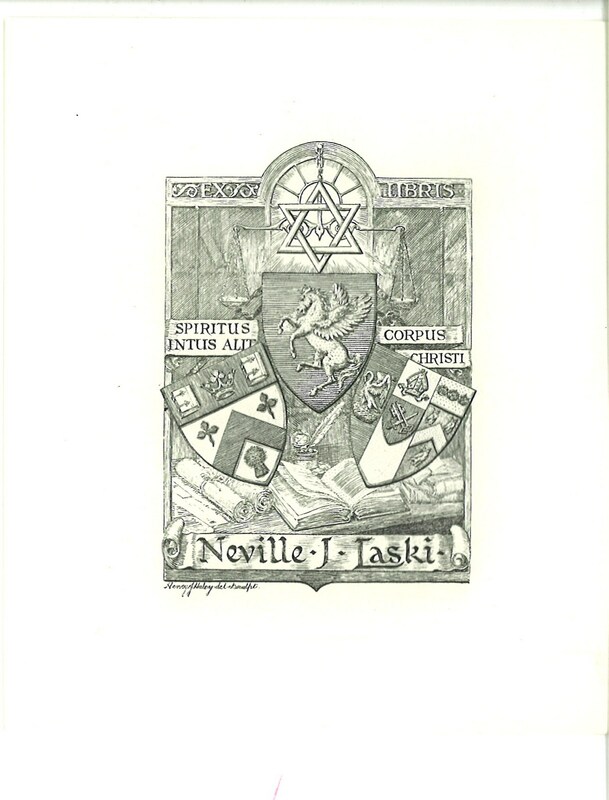 Other related items such as letters and book plates are also part of the collection. 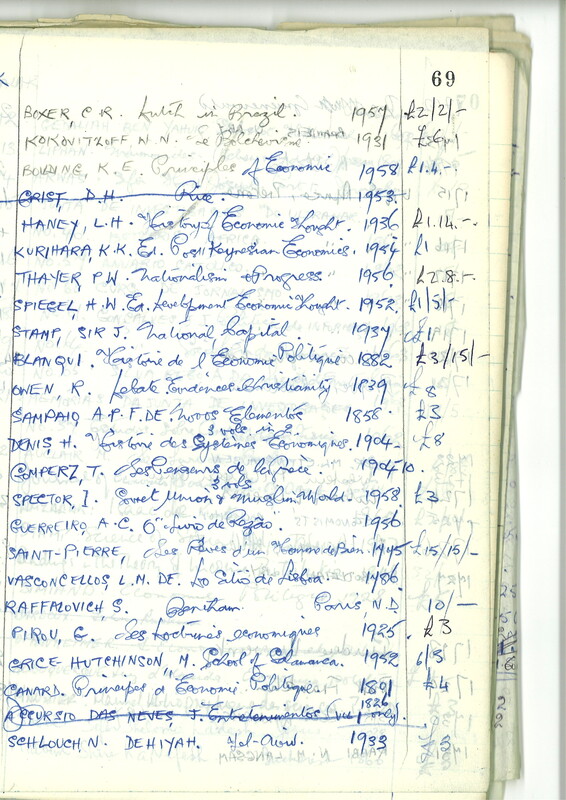 This entry was posted in Book restoration, Book Shop, Hebrew printing, Highlights on 9 April 2014 by zeidlerm. 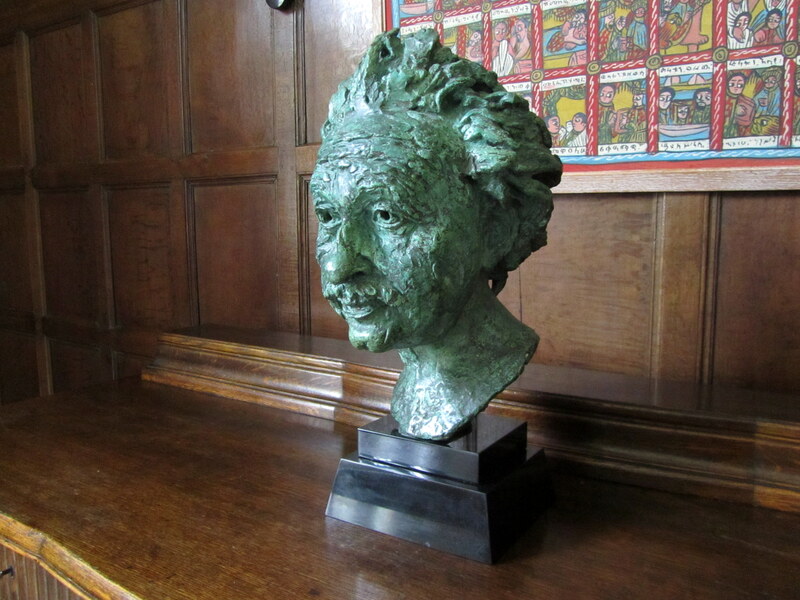 This term we have welcomed the arrival of a Bust of Albert Einstein by the famous British sculptor Jacob Epstein (1890-1959). The bust was gifted to the Oxford Centre for Hebrew and Jewish studies by Patricia Leonie Isaacs, Leonie Patricia Phillips and Phil Phillips. Epstein and Einstein met in 1933 in Norfolk, where Einstein fled from Berlin. It is said that Einstein smoked during the sitting, so much so that Epstein had to ask him to stop so that Epstein could see Einstein’s face clearly. 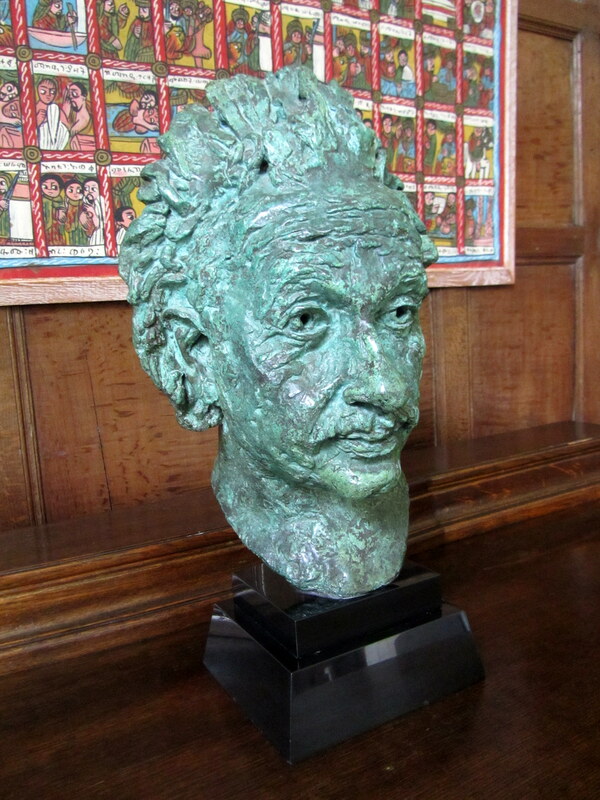 In 1933 Einstein moved to Princeton, before the bust was completed. There are also copies of the Bust in the science Museum, galleries in Birmingham and Liverpool and Australia and USA. It is a great privilege to have this wonderful piece of art at the Centre and it will be greatly treasured. This entry was posted in Highlights on 2 April 2014 by zeidlerm.